Materials: Crackle glass, White painted metal (iron), some metal parts. Porcelain sockets. Electricity: 3 x E14 bulbs, 3 x 40 watt maximum, 110/220 volt. 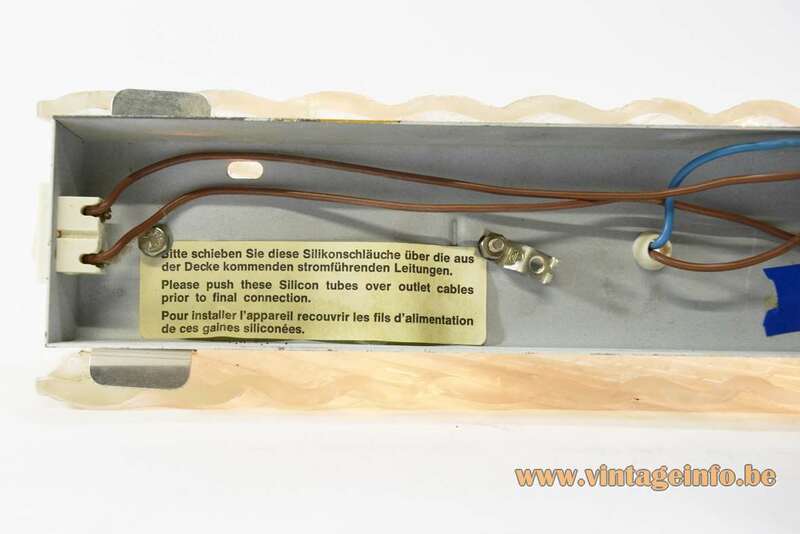 Manufacturer: Hillebrand-Leuchten, Neheim-Hüsten, Germany – attributed. 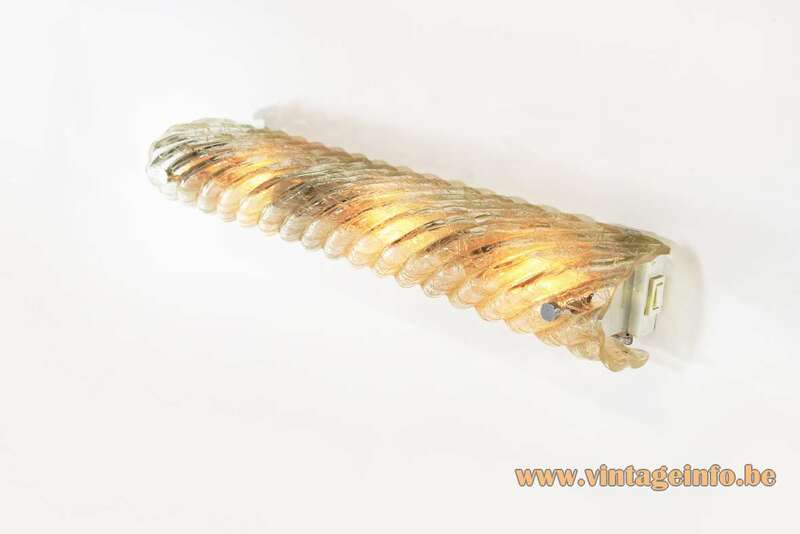 Other versions: Hillebrand produced several different wall lamps in this “Murano” style. Different texture in the glass, other formats. 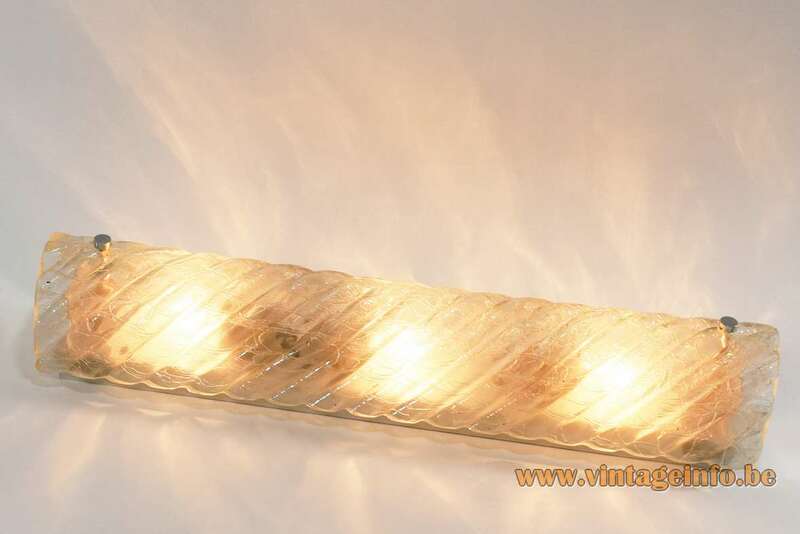 The glass of this wall lamp is made in the Barovier&Toso style. Barovier&Toso produced many lamps with this shape, often with gold flakes inside. Many companies made similar lamps. For example, Carl Fagerlund designed several lamps for Orrefors in this style in the 1960s. The label inside is written in 3 languages. First German, than English and underneath French. 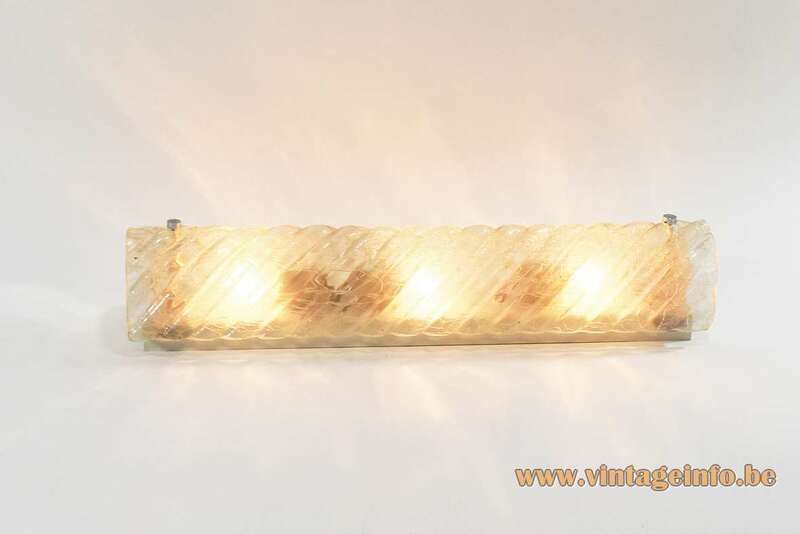 Egon Hillebrand Leuchtenfabrik, Neheim-Hüsten was founded on may 15, 1881 by plumbing and fitter master Egon Hillebrand as a producer of nickel silver lids for beer pitchers, established household appliances, kerosene lamps and storm and carriage lanterns. 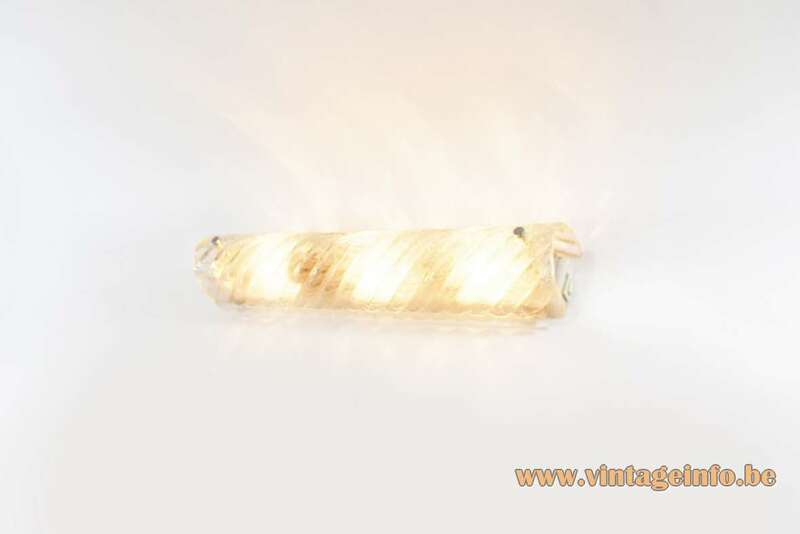 With the arrival of the son Franz, the operation was switched to the turn of the century in the manufacture of electrical lighting fittings. 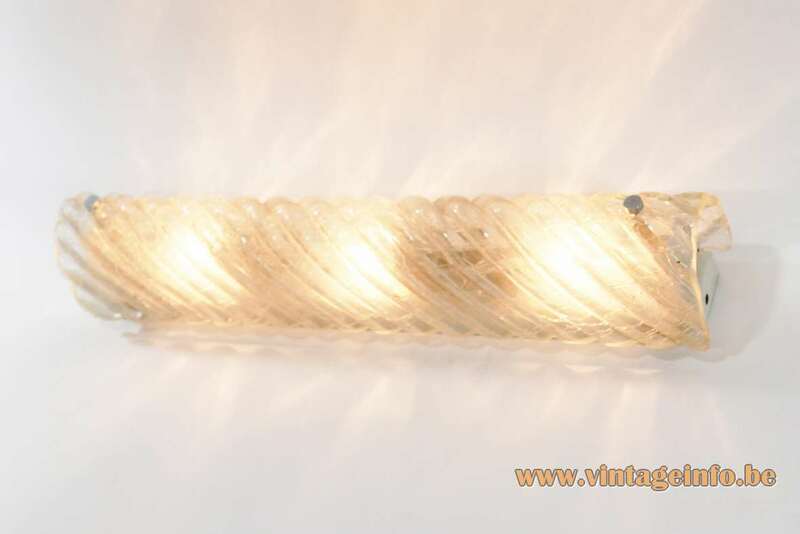 Around 1955, the collection was a representative, quality Rustic line “lights for restaurants and farmers bars“. The company filed for bankruptcy in 1995. Dr. Heinz Georg Pfaender was born 13 January 1928 in Heilbronn, Baden-Württemberg, Germany. He grew up in Kleingartach where his father Otto Hermann worked as a school teacher. In 1933 the family moved to Stuttgart. After World War II he became an architect. Later he joined and headed the office of Wilhelm Wagenfeld in the same town. At that time Wagenfeld was Germany’s most influential designer. In the late 1950s Heinz Pfaender moved to Darmstadt were he married Liselotte. He became one of the founders of the design department of the the local university. During his career he wrote several books and designed many items: from small to heavy machinery to daily life goods. In 1961 he designed the Oslo table lamp and in 1963 the Bornholm desk lamp. Two design-icons of the Hillebrand company. He resigned as a professor in the mid 1990s. Professor Dr. Heinz Georg Pfaender passed away on June 8, 2015. He left his wife, 2 children and 4 grandchildren behind. Ernest Igl (1920-2001) designed several lamps for Hillebrand in the 1950s. Odo Klose designed a floor lamp (model 5225). The switch is made by Acciarri, an Italian company. Acciarri is an Italian family name, mostly found on the east coast of the country. Nothing to be found about this company, it must be long gone. Acciarri also produced switches and other electric parts for Reggiani, the famous Italian lightning company. Also Massive from Belgium used Acciarri parts. And many other companies, of course. It is not so exceptional that the electrical components are Italian. 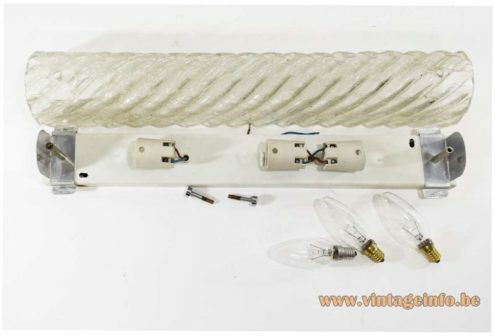 Many European light producers used Italian parts.